"Yachts For Sale" in all of Southern California. We value every client that walks through our doors. Our business grows because of our sustained relationships. We take pride in exceeding our clients’ needs and expectations before, during and after the sale, providing assistance in all aspects of boat ownership. The Art Brooks Sea Company Was Established In 1994 As A Premier Brokerage House For Previously Enjoyed Vessels. Semi-Custom, Performance Enhanced Vessels, Renowned For Their Speed, Luxury & Stability At A Comfortable Price Point. Over 10 Models and 27 Configurations to Choose From, Ranging In Size From 65' Up To 125'. Many Owners Have Upgraded Two & Three Times, A Testament To Their Brand Loyalty, Confidence And Satisfaction With The Yachts Johnson Builds. Superior Designs For Ultimate Sea-keeping Abilities, Exquisite Craftsmanship, And Intelligent Layouts That Just Make Sense Are But A Few Of The Features That Attract The Most Discerning Buyer. Johnson Luxury Motoryacht's Are Bold And Expressive, A Reflection Of Your Vision, The Reward For Your Success, The Reality Of Your Dreams! Looking For A Brokerage Vessel? We List Many Quality Previously Owned Vessels. Please Select The "Fine Brokerage Yachts" Link On The Side Bar To View Our Inventory, or contact us and put our knowledgeable sales staff to work to find your dream vessel. We have years of experience in the sale of charter boats and charter businesses. They are an excellent business opportunity for either a part time or full time operator. Local Charter Operators are reporting an uptick in business this year with some claiming a 20% or better increase for 2014. Now Available at "Art Brooks Sea Company". Yacht Controller is a "wireless remote controller" that enables you to safely maneuver your boat closer to a dock, or within other confined spaces, utilizing your vessel's own propulsion systems. We welcome the opportunity to add you to our growing list of satisfied clients. Your satisfaction is our commitment. 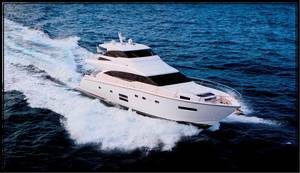 The New Johnson 70 Enclosed Pilothouse Motoryacht! The New 70' JOHNSON offers the very latest in marine technology and design utilizing an open floor plan concept that increases visibility of your surrounding for your enjoyment. Powered with twin 1015 HP Cat C-18's coupled with reverse down angle drives and joy stick control, With both bow and stern thrusters, provides excellent maneuverability and efficiency. A sensational open floor plan flows through the salon, dining settee and galley enhancing an already spacious layout. You have a choice of either three staterooms and an office, or a 4 stateroom layout plus crew quarters, either way the master is full beam with a King sized berth that would not change with either layout. The enclosed sky-lounge with helm also has a private lounge area. The finishes and inclusions are state of the art as well as the level, and quality of finish is top shelf. Building boats of distinction for over 25 years, Johnson has earned a loyal following of repeat clientele. Visit us today to explore your options of having one of your dreams come true.